A sense of endearment surrounds the hard luck loser. You see them put in all the right work in all the right ways leading up to a given moment, and then, for whatever reason, the thing they were going for doesn’t work out. If it’s not a sense of endearment that surrounds them, then it’s one of community: everyone understands working hard and falling short. 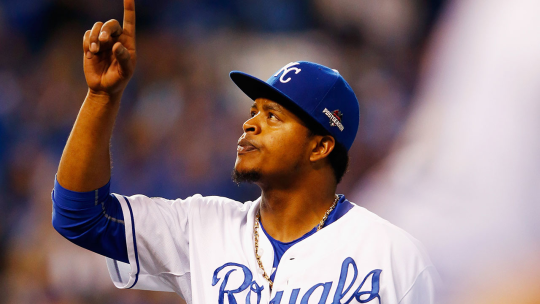 In a very particular sense, that’s Edinson Volquez. While he signed a two year, $22 million dollar contract this offseason, it was also with the Marlins. They need innings after the heart-sinking loss of Jose Fernandez, and that’s what Volquez probably provides most consistently. But as Jeff Sullivan points out, they can have no idea what kind of innings they’ll be getting despite consistent raw skill through his whole career. I’ve dug into how frequently pitchers give up a hit or fielder’s choice when ahead with two strikes. The parameters are based on the concept of coming out equal, at best, when in the most advantageous counts. These numbers might seem a bit obtuse – we’re talking about 1%, give or take, of 2,500 pitches or more. It’s fair to wonder how much impact we can decipher from 25-50 individual pitches, or even consider it straight up noise not worth paying attention to. But the volatility of Volquez means particular moments become very meaningful. Historically, those moments go awry for him. In 2016, he was first in Hard Luck. In 2015, he was 7th. In 2014, he was 49th, but also a part of the Pirates rotation, which has had at least three pitchers near dead-even with or better than the league average on bases given up when ahead with two strikes for the last four years. 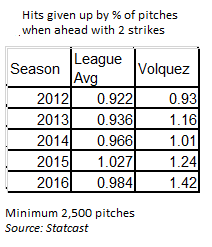 The chart shows us a trend over the last of half Volquez’s career that supports how he has a harder time, or less luck, getting outs when ahead with two strikes. In particular, the last two years show a conspicuous upward trend. Yes, with a data set so small the percentages can change rapidly. Five additional hits can account for a .18 difference, or the difference between his last two seasons. While the small sample could be used to dismiss the results, they also highlight how weird baseball is and how consistently that weirdness has worked against Volquez, given league averages. And if you’re wondering how team defense might impact him in the move from KC to Miami, the Royals (17th) and Marlins (19th) were both middling last year according to MLB.com’s defensive efficiency ratio. Miami hasn’t made dramatic personnel changes to influence that. Taking a minute to play with heatmaps at Brooks Baseball shows that Volquez pounds the lower part of the zone pretty well when ahead with two strikes. Suggesting a change would really only be suggesting more consistency, which is probably less likely to happen for him than more at this point in his career. Maybe Volquez studying his sequencing could yield a positive impact on his results, but, unlike with other pitchers I’ve written about, no particular suggestion shows itself. I suppose that’s the hard luck part of it. What remains is the Marlins signed him for exactly the value his performance would predict, and, more for him than other pitchers, only a few specific pitches this year could influence how true that ends up being.